Here is an article that shows several medical statistics, State by State. 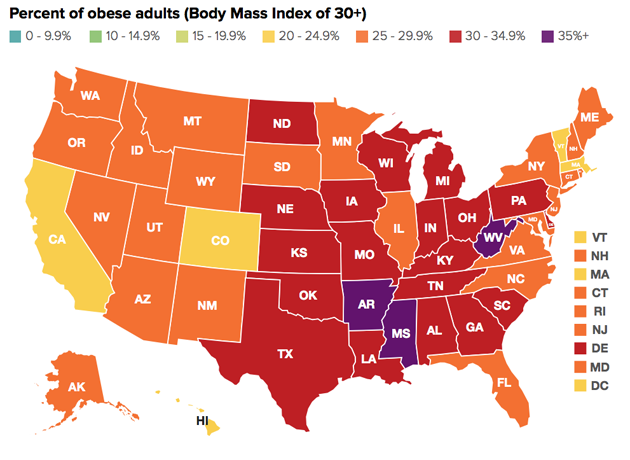 According to the article, the Midwest of the US and the South of the US are the fattest, sickest parts of the nation. If you read the comment section, it outlines the reason why this is so…because nobody seems to know why people get fat. They blame the weather, it’s hot and humid, which, it is believed makes people stay indoors. This is the idea that not working really hard makes people fat. Why it would give them high blood pressure and diabetes is not discussed in the comment section, but they wrongly believe that weight and exercise are directly proportional. They are not. Some of the fattest people on the planet also have the most physically demanding jobs. They blame eating fatty foods, even though you can’t get fat by eating fat. Nobody, in all of the comments that I read blames carbohydrates. A few blame junk foods and processed foods, but because of the fats that they contain more than the sweets. People want to blame the obese for eating too much, but why, suddenly would 40% of the people in one state be eating more than they ever did? Answer:they aren’t eating more than before! The food they are eating is full of sweets and starches more than ever before. It’s not the people, its a combination of lousy advice and food that is getting worse and worse for them. This entry was posted in Health, Living and tagged high blood Pressure, obesity. Bookmark the permalink.